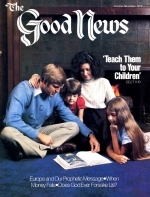 God Speaks Out on "The New Morality"
Vice-president, Ambassador International Cultural Foundation; ordained evangelist in Tucson, 1979. Once, in the beginning of things, God who became the Father said to God who became Jesus Christ, "Let us make man in our image" (Gen. 1:26). And it was so, and man began in the process of becoming a being like God. Your goal as a Christian is to become like God, in His image. But what do you perceive that image to be? Are you sure that you're working toward becoming like the real God or is your eye focused on some false image of your own devising? The Bible many times relates what man's perception of God must be. For example, God said, "Thou shalt not make unto thee any graven image [to represent God]" (Ex. 20:4). But man has all kinds of gods. Historically, human beings have made gods to look like, among other things, fish, beetles, the stars and the sun. Anything but the true God, it seems. The irony is that all those idols of wood, stone, metal or whatever else used to depict God, indicate something rigid and lifeless. The God they may intend to depict is the complete opposite — full of life and the possessor of all power. Do you remember the Old Testament account of Daniel and his friends? They had the right image of God. Nebuchadnezzar built a gigantic image, probably of himself, and he expected everyone to bow down to it. When it was reported to Nebuchadnezzar that Shadrach, Meshach and Abed-nego were not doing so, they were brought before the king. Daniel 3:16: "Shadrach, Meshach, and Abed-nego, answered and said to the king, O Nebuchadnezzar, we are not careful [we don't have to spend a lot of time thinking about how] to answer thee in this matter." They had already determined that God is God, and Him only would they worship. And neither Nebuchadnezzar, nor a huge idol, nor any man, nor any being was going to alter their thinking on that matter. "If it so be, our God whom we serve is able" — now they didn't say, Well we don't know, but we think He can do it. No, they said, He is able — "to deliver us from the burning fiery furnace, and he will deliver us out of thine hand, O king" (verse 17), either way. If we're burned up, then we're delivered out of your hand, or if God saves us we're delivered out of your hand. But we know God is able to save us. "But if [He does] not [choose to save our lives], be it known unto thee, O king, that we will not serve thy gods, nor worship the golden image which thou hast set up" (verse 18). Perhaps none of us today would bow down' before such an obviously false image, but are we bowing down to idols that are not so apparent: riches, pride, prestige, power, position, status? God is the most known quantity and the most fixed quantity in the whole of the universe. That's something that we have to know. He says, "I change not" (Mal. 3:6). We don't change God by what we think God is. We may change our impressions, but that doesn't change God. Recently, I was talking to a lay member of another church, and he finally got bold enough to ask why we keep Saturday instead of Sunday. And I told him. It's the day God created in the beginning to be kept. It's also the day that Christ kept, and we don't feel that we have the right to change that. And he says, "Yeah, but what's wrong with Sunday?" And I said, "Nothing's wrong with Sunday, except it's not the Sabbath, that's all." We got into the trinity, heaven and hell and so forth. But we always came to a dead end because of his faulty image of God. Man tries to make the true image of God conform to his own desires, continually altering and reshaping it until it becomes so distorted that even God Himself can't recognize it. And when we do not have the proper image of God fixed in our minds, we don't know exactly what we can rely upon Him for. How can we call in faith upon a god whom we do not know? We would have no assurance of what his response might be. That was ancient Israel's problem. The Israelites were tremendously excited and encouraged as they came out of Egypt. For the first time, as far as that generation was concerned, they were able to experience freedom. But they also faced severe problems because their image of God was little more than an image of a man, Moses. By developing an image in your mind that's not God, you make it impossible to become like Him and be in His family. Even after receiving manna from heaven, wearing clothes and shoes that never wore out and drinking miraculously purified water, they couldn't see God's hand in it. Their image of God was extremely poor. And the new generation, after crossing the Jordan River with Joshua into the promised land, and after God gave them Jericho, didn't enjoy long-lasting success because they quickly lost sight of God. Today, does your image of God carry you over even until the next problem appears over the horizon? We know that Christians are to become like Christ. But do we know what Christ is really like? In Colossians 1:9, Paul expressed his desire that we increase in our perspective of God that (verses 10-17) "Ye might walk worthy of the Eternal unto all pleasing, being fruitful in every good work, and increasing in the knowledge of God [that is, in our overall image of God]; Strengthened with all might, according to his glorious power, unto all patience and longsuffering with joyfulness. "For by him were all things created, that are in heaven, and that are in earth, visible and invisible, whether they be thrones, or dominions, or principalities, or powers: all things were created by him and for him: And he is before all things, and by him all things consist." Now that gives us quite an image of the One we are to become like. What He was and what He is now, at the right hand of His Father. "And he is the head of the body, the church" — is that our image of Christ? — "who is the beginning, the firstborn from the dead; that in all things he might have the preeminence. For it pleased the Father that in him should all fulness dwell [just like the Father]; And having made peace through the blood of his cross, by him to reconcile all things to himself; by him, I say, whether they be things in earth, or things in heaven. "And you, that were sometimes alienated and enemies in your mind [because you had a wrong image of Christ, as we had, as the whole world has] by wicked works, yet now hath he reconciled [not only to have our sins forgiven, but now to have a right image of Christ] In the body of his flesh through death, to present you holy and unblameable and unreprovable in his sight: If ye continue in the faith grounded and settled, and be not moved away from the hope of the gospel" (verses 18-23). It's a very human tendency to try to create God in our own image, thus eliminating the need for much change in our lives. But that's not what God wants. That's why prayer is so important. Because through prayer you get to know God and develop a relationship with Him. And Bible study — studying His Word — gives you factual information about your Creator. Then the Holy Spirit can increase your understanding, wisdom and ability to do what God expects. I think a lot of times we get the idea that prayer, Bible study, fasting, all those things, are theoretically great, but we don't really see the practical need for them. I tell you, there is an absolutely vital need if we are ever going to have the right image of God and accomplish our goal of becoming like Him. There's no other way. If your prayers seem to fall on deaf ears at times, remember God says, "Behold, the Lord's hand is not shortened, that it cannot save [that it cannot provide a way of escape from every temptation, that it cannot save us from death, that it cannot give us eternal life]; neither is his ear heavy, that it cannot hear" (Isa. 59:1). God can and does hear and is able to respond to our needs. If He isn't hearing, perhaps you are worshiping a false image rather than the true God. Let's not let our image of God be warped by Our own weaknesses, our own infirmities, our own inability to serve and conform to that image of God that Christ established. God created us — in His likeness — for the express purpose of becoming like Him. We can't alter God. He doesn't change. We have to conform to His image. We must develop the character attributes of God, not follow some imperfect concept of our own imagination. And that takes a great deal of time and effort, and an abundant supply of the Holy Spirit. Once we develop these characteristics — and God pours out His abundant grace on us — we will be born into the Family of God.